In just over a year, Andrew Carlisle has come a long way — literally and figuratively. Carnegie Mellon University's new director of piping joined the faculty last year from his native Northern Ireland. And he's breathing new life into a beloved school tradition reflecting the heritage of another Andrew — Carnegie. Carlisle is one of the world's leading 'pipers,' winning numerous awards as both a soloist and member of a world-champion pipe band. As a solo artist, Carlisle has performed all over the world: at the White House in 2008, for the 100th anniversary of the U.S. Army Reserves, and in front of 50,000 people at the Oz Stadium in Sydney, Australia in 2010, as part of The Royal Edinburgh Military Tattoo. 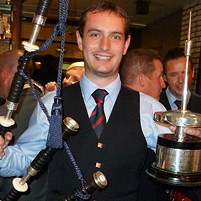 He has won four world pipe band championships with the Field Marshal Montgomery Pipe Band, and captured the William Gillies Memorial Challenge Cup, one of the most prestigious awards in solo piping. "I'm hoping to make a significant contribution to both the university and the North American piping scene," he said of his move. In just a little more than one year, he's made strides in re-invigorating CMU's piping program. It's one of only two in the United States to offer a bachelor's degree in piping and the only offering a master's degree. Three students are now enrolled as bagpipe majors and 10 as minors. He's also been busy rebuilding the pipe band, which has already moved up a competitive grade. The band has 34 members and 12 non-music majors are learning to play the instrument from scratch. Carlisle began his own lessons as a 7-year-old in Ballygowan, a small village near Belfast. "The Great Highland Bagpipe is one of the most challenging instruments and also one of the most temperamental," he noted. "The repertoire is extremely diverse. I perform everything from the ancient Scottish art form, piobaireachd, where compositions can be more than 500 years old, to contemporary virtuosic pieces." Yet another Andrew, now a CMU master's student, became equally fascinated by the instrument while playing the flute as a child in Ohio. "I came to play the pipes purely by happenstance," said Andrew Bova (A'11,'13). "When I was 11, I played in a Fife and Drum Corps. I met some pipers and fell in love with the instrument, culture and people." Within a year, he'd set his sights on one day attending CMU. It was the right choice. "The School of Music is a fantastic organization run by wonderful people and the classical education I received in addition to my piping education is the program's greatest strength," said Bova. "Graduates don't simply leave as great pipers, they leave as well-rounded musicians." He added, "I had no plans to stay on for my master's until I began studies with Andrew. I realized he was not only a great piper but also an academically minded individual and gifted pedagogue. He has brought a new perspective to the program and strengthened it immensely during the short period he has held the reigns." Carlisle is far from done. "My goals are to recruit more pipers to CMU, to continue to allow non-music majors the opportunity of learning how to play, and to continue to develop the CMU Pipes and Drums into a top-flight musical ensemble."